It is the essence of hatred and discrimination against anyone who is different or vulnerable, including people who are different because of their racial or ethnic background, sexual orientation or people with mental illnesses or neurological disorders. Children with autism disorders are subject to bullying even by public figures seeking to promote their tired careers as shock jocks and comics. On February 25, 2009 Facing Autism in New Brunswick will wear pink. On February 25, 2009 I will wear pink to stand up against bullying. On April 27, 2008 I noted that Conor's Counting & Stimming YouTube video had hit 2,050 views. Now I am pleased to say that the video has been viewed 5,000 times. The viewing numbers have not been boosted by multiple CNN appearances by Conor. It is not a scripted, dramatization of what stimming might look like. 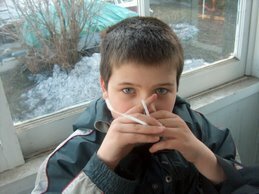 It is an actual portrayal of Conor, a boy with Autistic Disorder, stimming with his favorite stim object, a straw. I am pleased that so many interested persons have seen the video and have seen what stimming looks like Conor style ... with no agenda and no pretense. For Conor stimming is not a language, or abstract form of communication with distant objects, it is a very immediate, physical and sensory activity which he enjoys and which helps him stay calm. As simple as that. If Autism Is A Joy Why Is It In The DSM? If autism is a joy, a simple natural variation that brings with it many blessings, then why is it found and described in the Diagnostic and Statistical Manual of Mental Disorders of the American Psychiatric Association? Why are children as young as 2 years of age diagnosed with autism spectrum disorders ... Pervasive Developmental Disorders? Why do parents take their children for medical assessments that result in "autism spectrum" diagnoses? If their condition was one which brings such great joy then why visit a doctor to discuss it? I am one of those old fashioned males who doesn't particularly like visiting doctors' offices. I will probably live a somewhat shorter life than I otherwise might because I just don't like going to see the doctor on a regular basis. I can not imagine going to a doctor to have him/her examine, assess or diagnose .... a joyful condition. What would possess some of the persons assessed as adults with autistic disorders to attend at the offices of a medical or psychological professional for an assessment of a joyful condition subsequently diagnosed as autistic disorder? If the medical model of autism is to be cast aside, as those in the ASAN/Neurodiversity movement headquarters at the Change.org "autism" page advocate, then why refer to autism, a medical term, at all? 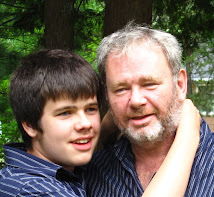 When I Am Dead Will My Son Encounter Frozen Indifference? If you are the parent of an autistic child you worry about your child's future. If your child is severely autistic, if you already know that, after you die, he will be dependent on the care of strangers, then you will be haunted by worries about how he will be treated, how he will be cared for, ... his quality of life .... even his safety and security. The shocking Max Ortiz photo was taken after Charlie LeDuff of the Detroit News was contacted by an "urban explorer" playing hockey on the frozen floor of an abandoned warehouse in Detroit with some friends. None of the men called the police and continued their game after seeing the body frozen in the ice. 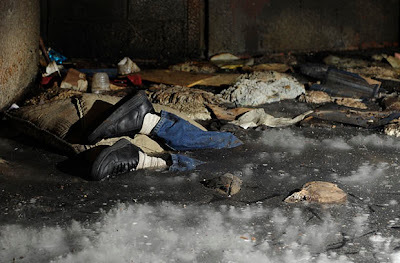 In Frozen in indifference: Life goes on around body found in vacant warehouse LeDuff describes the macabre scene that he found and reports on the plight of the homeless in Detroit. 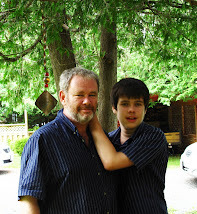 The photo and the story stoked my own fears for my autistic son's future AD ... After Dad. "the private sector residential facilities for the mentally retarded have become an $11 billion-a-year business.. Millions of Americans with these life-long handicaps are at risk for poor quality care, questionable and even criminal management practices by service providers, and lackluster monitoring by public health and welfare agencies." "Former employees of one facility reported that prescribed medications for residents are routinely discarded." Dr. Cindy Ochs, of Livonia, Michigan, who cares for mentally retarded residents at about forty metro Detroit homes, stated, "They're hiring people off the street for five or six dollars an hour to care for patients who have complicated seizure disorders, feeding tubes, all kinds of problems." Under these conditions, it should surprise no one that death rates have risen to horrifying proportions. As we recently reported (ARRI 10/4, 1996), a study by David Strauss and Theodore Kastner, based on 18,000 adults who were "clients" of the Department of Developmental Services in California from 1980 to 1992, found the death rate to be 72% higher in group homes than in asylums. A more recent study of nearly 1,900 California patients transferred to group homes from asylums in 1993-1994 showed an 82% higher death rate in group homes. In both studies, the "institution" and "community" patients had been carefully matched on all known risk factors. Death can come quickly to those removed from institutions. Ten patients died after being discharged from the Porterville Developmental Center into group homes. "Most were middle-age and had lived much of their lives in state centers," the San Francisco Chronicle reported on February 25, 1997. "Their average life span after leaving Porterville: just 62 days." As Strauss points out, "deaths are but the tip of the iceberg. Where there's an excessive number of deaths, there's an excess of other types of medical problems. for every death, there are many emergency hospitalizations." And, obviously, for every emergency hospitalization, there are a multitude of untold and unrecorded tales of hunger, neglect, and abuse of every imaginable kind. The situation is so clearly monstrous that even the most vocal advocates of the "close the institutions" school of thought (actually non-thought) have been forced to change their tune. 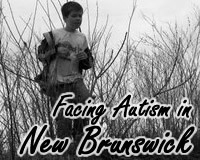 Here in New Brunswick we have made great strides in provision of services for people with autism disorders during the pre-school and school years. 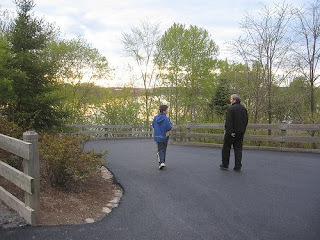 At the adult level though we have an antiquated, inadequate and chaotic system of residential care for autistic adults. Despite the number of persons with autism disorders and the complexity of challenges in caring for them we lump them into a general adult care system with inadequately trained staff, inappropriate locations and diets, lack of exercise and activity, and lack of security. Even stability is not guaranteed with a residential care facility closing recently with just 24 hours notice. But it is the lucky autistic adults who reside in these facilities. We have some that we have to export to other provinces, even to the US, far from family members. We have at least one autistic adults living on a general hospital ward. 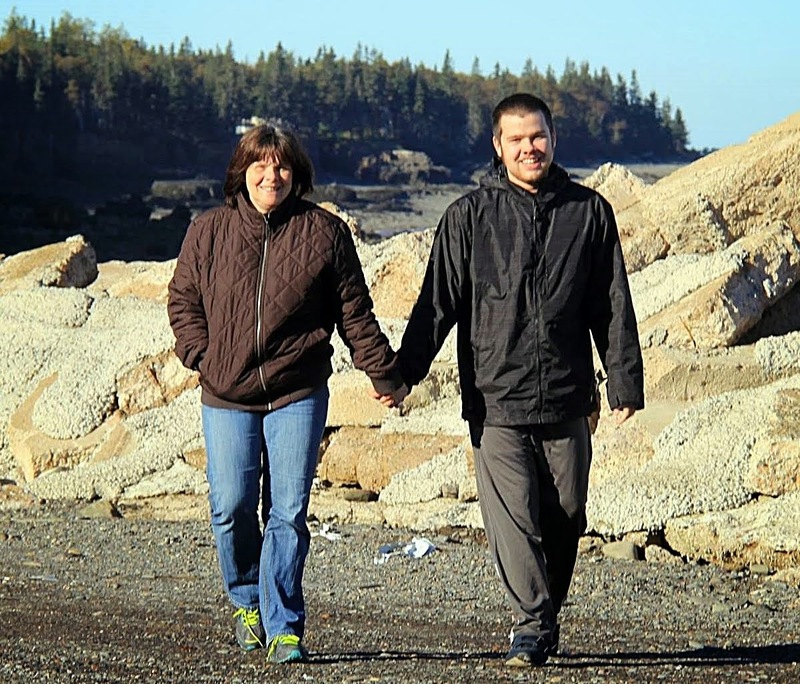 We have to do something for New Brunswick adults with autism disorders. And we have to get started now. 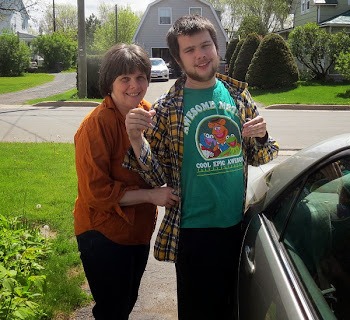 If we do not, we have to live with the possibility that our grown autistic children will meet with frozen indifference once we are no longer around to help. I was contacted a while ago by an individual using the pseudonym Milburn Drysdale. He let me know about an autism site he had started called Autism Funding in BC or Autism Funding for Dummies. At first I figured one of my friends at the Autism Hub was trying to play a joke on me. For those too young to know Milburn Drysdale was the name of the Clampett's wealthy banker, played by Raymond Bailey, in the '60's sitcom "The Beverly Hillbillies". 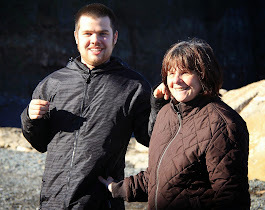 The site is legit though and Mr. Drysdale offers some very helpful financial and other resource information and links for families with autistic children in British Columbia and elsewhere in Canada. If you live in Canada and have an autistic child check out Autism Funding in BC or Autism Funding for Dummies. Tell them Jethro sent you. He is a boy, a young man, who will soon turn 13. He is affectionate, fun loving and has a great sense of humor. He loves being outdoors and experiencing all of it - including the snow of which we get a fair bit in this part of the world. Like many other Canadian kids Conor loves to get right down in the snow and feel it's coolness. He likes to play with balloons and he stims, usually with straws. Conor loves to play on the computer, PBS KIDS, Dr. Seuss Youtube videos and above all O Canada videos. Last year he had a perfect school attendance record. Because he loves school and because he is a healthy, well cared for boy. 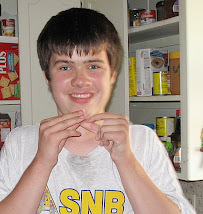 Conor has Autistic Disorder, assessed with profound developmental delays. He occasionally injures himself through biting or hitting his head with his fists in frustration. Sometimes he grabs others by the hair or pinches their faces hard. He is not trying to hurt anyone but it happens. Conor can not safely leave home unattended. At 13 we know he will not live independently. After I am dead he will be cared for by strangers. 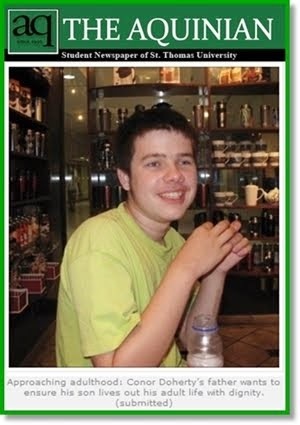 Conor has Autistic Disorder, a neurological disorder, a fact forgotten by self promoting "auties" and "autistics" who glorify neurological disorders. I don't know what an "autistic" is. I know it is a label used by some persons who have Pervasive Developmental Disorders as a means of imposing their views of themselves and their disorders on families, parents and children they don't know, and with whom they have very little in common. It is a label based on their own self images. 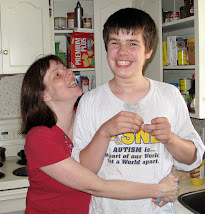 Conor is a boy, a young man with a neurological disorder, but he is much more than his autistic disorder. He is my son, he is a great joy in my life, and the lives of others who know, help and care for him and I will not allow those who do not know him to reduce him to a label of their making and design. 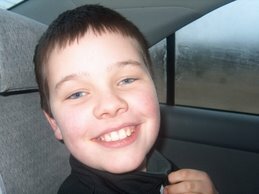 Conor is not an "autistic". A new national Ekos Poll gives U.S. President Barack Obama an 81 percent approval rating among Canadians, more than twice the favorable rating of Canada's Prime Minister Stephen Harper. The poll of 1,000 Canadians, conducted Jan. 15-17, found that only 35 percent of those surveyed approve Harper's performance in office, compared to 55 percent who disapprove. There are too many striking differences between the charismatic, high minded, non-partisan President Obama and the narrow minded, partisan Prime Minister Harper to begin to list them all in a simple blog commentary. This blog though is about autism and the differences are shown clearly in the two leaders aproaches to dealing with the autism crisis confronting our countries. President Obama sought input from all sources on autism using modern internet communications technologies and he has committed to helping Americans with autism. Prime Minister Harper held a closed door "symposium" which intentionally excluded advocates for evidence based autism treatment for all Canadians. Unlike Mr. Obama, Mr. Harper refuses to commit to helping Canadians with autism preferring to hide behind irrelevant Constitutional jurisdiction arguments. (The Canada Health Act exists despite such arguments). I don't suppose our American friends would consider trading leaders? "If you keep looking under the same rock, you're going to keep finding the same thing. Over and over, the science has shown there is no causal link between vaccines and autism. It's time to look for answers in new and different places." Ms Singer will undoubtedly give more interviews rationalizing her decision to help prevent credible vaccine-autism research. Hopefully she will do more than regurgitate the same points and offer some informed responses to those very credible sources, like former American Red Cross and NIH head Dr. Bernadine Healy, who have articulated compelling arguments for further studies of possible vaccine-autism connections. But Ms Singer is on the right track this time. There is wisdom in her comments about looking under different rocks. That is exactly what the Interagency Autism Coordinating Committee had decided to do in December 2008 before Ms Singer joined IACC officials in reversing that December decision. Ms Singer with her vote helped prevent new rocks from being lifted, new information from being found. PRE-NOTE: This handbook is also known as the Neurodiversity Handbook and is a clumsy satire of another clumsy satire. NOTE: This "handbook" is a work of clumsy satire. It is meant to point out some ways that people dis-empower and violate the rights of autistic children, as well as parents and other carers who actually know them, care for them, are responsible for their well being and advocate on their behalf . As a Neurodiversity Advocate and ASAN member, disempowering autistic children and violating their human rights are practices I strongly disapprove of every February 29th. Strategy 1. Make sure you have an autism disorder diagnosis of some kind. 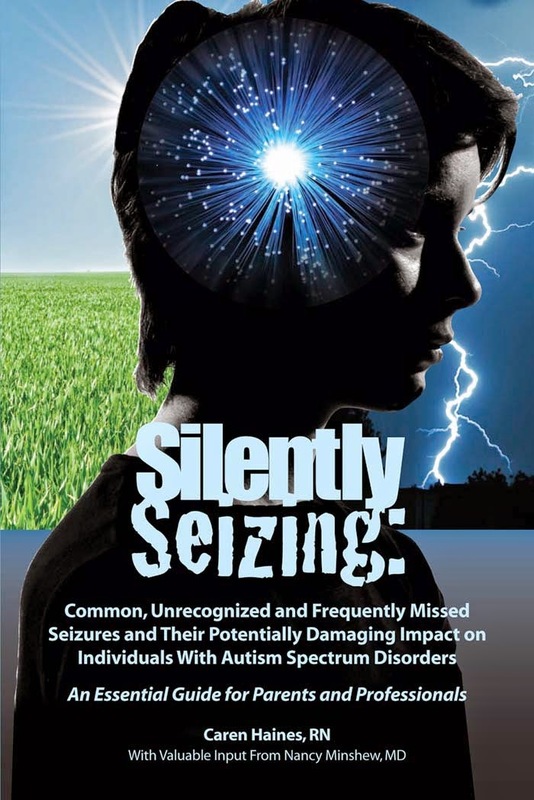 If you are currently diagnosed with ADD, schizophrenia, bipolar disorder or some other unrelated disorder, lobby an enlightened neuro-scientist/researcher, or actual practicing doctor, to give you a Pervasive Developmental Disorder diagnosis preferably Autistic Disorder. If all you can wrangle is an Aspergers Disorder diagnosis, not to worry, you can still start your own Autism self advocacy network because you are "on the spectrum". You are now licenced to offer the perspective of all "auties" and "aspies". CNN, CBC and the New Yorker will soon be pounding on your door. Strategy 2. Establish a media center. Organizations like change.org, which sound like change.gov, are very helpful as media centers. They appear to be very progressive and generally promote progressive, environmental and humanitarian causes. Change.org itself, if you can hook up with them, can offer good cover for your regressive campaign to dis-empower autistic children and violate their human rights as defined in international legal instruments like the United Nations Declaration of the Rights of the Child (1959). 3. Deny that autism disorders are medical disorders. Having obtained a medical diagnosis of one of the "autism disorders" you must now argue that autism is not a medical disorder. It is just a natural variation, This strategy is essential to your success in dis-empowering autistic children and violating their rights to treatment. International legal documents like the UN Declaration of the Rights of the Child insist that children have a right to medical treatment. It will make your anti-autism treatment campaign much more difficult to sell if you acknowledge that autism is in fact a medical condition, a neurological disorder. It may seem contradictory, confused, illogical, inane, even irrational, to seek a medical diagnosis for an autism disorder and then tell the world that autism is NOT in fact a medical disorder. And of course it is contradictory, confused, illogical, inane, even irrational. But not to worry. The lightweights at CNN, CBC and other major media outlets are not likely to pick up on such little details. 4. Attack anyone who speaks the truth about the negative realities of autism disorders. Do not let anyone get away with telling the world that their autistic child engages in serious self injurious behavior, has serious communication challenges and understanding of the world, or faces a life of dependency. It is usually concerned parents who love their children, care for them daily and actually know them as individuals that speak openly on such negative facts. It is crucial for your own self importance and credibility as an autistic spokesperson bent on dis-empowering autistic children that you be seen as knowledgeable about these children you don't actually know. You will have to discredit such parents by accusing them of spreading harmful negative stereotypes about "auties". They may be factually correct but they make you feel bad and are therefore wrong. Be sure to portray such parents as over-emotional, desperate, delusional and even dangerous. Media can usually be counted on to go along with this strategy. 5. 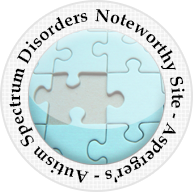 Criticize any reference to functioning levels or severity of autism spectrum diagnoses. It will be a hard sell to convince people that you know better than a parent who actually knows their own child what life is like for their autistic child and what is good for them. The task is also complicated by your obvious abilities with language as you hob nob with neuroscientists, write sophisticated internet essays and appear before international media. It violates common sense to suggest that you have much in common with a 12 year old who struggles to read Dr. Seuss or does not understand the danger to their life posed by automobile traffic. Therefore you must relentlessly attack any attempt to distinguish between Aspergers, High Functioning Autism and Low Functioning Autism. Only if you pull off this scam will you be able to convince public authorities that a low functioning autistic child with limited communication skills should not be treated or cured and further more does not want to be treated and cured. Because, after all, you say so. If you find yourself in a pinch and need an authority for the argument that autism is 100% genetic, that "autistics" do not want to be cured, or that you should speak for the autistic child who can not speak for herself, instead of her parents, consult the wisdom of the Greek and Roman Classics as revealed in The 10 Neurodiversity Commandments. When there is no scientific, legal, common sense or moral basis to your arguments The 10 ND Commandments are good backup. Trust them, rely on them, do not question them. These outbreaks have not, apparently, been sobering. If anything, the number of parents choosing to delay or withhold or separate vaccines is increasing. So what will it take? How rational are public health authorities and health care professionals who express concern over increasing non-vaccination rates of children of parents concerned the vaccines might trigger the onset of autism in their children? A strategy in place, for over 10 years, of demonizing parents and researchers who claim that vaccines cause or might cause or contribute to the onset of autism disorders has failed. Yet public health spokespersons continue the same failed strategy expecting different results. Research of a possible vaccine-autism connection has been actively discouraged by public health authorities as was noted by researcher Teresa Binstock in 1999. Ms Binstocks observations can be confirmed in public health documents like the 2004 IOM report on autism and vaccines. At the same time authorities and spokespersons simply choose to ignore and not respond to, public statements by such a credible authority as Dr. Bernadine Healy, former head of the NIH and the American Red Cross who has pointed out the need for research, beyond epidemiological studies, of possible vaccine-autism connections (1)(2). 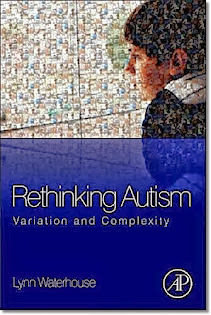 Teresa Binstock also pointed out in 1999 that parents offering anecdotal evidence of a vaccine-autism connection, and researchers who attempted to study such evidence, would be demonized by spokespersons for public health authorities and what she has predicted has come to pass. Her predictions are reflected in the recent media offensive, led by Dr. Paul Offit and Alison Singer, to promote demeaning views of parents who believe, based on their observations and knowledge of their own children and their development history, that vaccines played a role in their children's autism onset. At the same time very credible critics like Dr. Bernardine Healy, who has made a case for proper research of possible vaccine-autism connections are ignored. These outbreaks have not, apparently, been sobering. If anything, the number of parents choosing to delay or withhold or separate vaccines is increasing. So what will it take? Certainly, as more and more children contract measles and pertussis, deaths from these diseases will follow. And it's not a leap to believe that we could see other deadly diseases, like polio and diphtheria; both of which still occur commonly in some areas of the world; and both of which are only a plane ride away from causing outbreaks in relatively unvaccinated communities in the United States. Dr. Offit's question is rhetorical at best and cynical at worst. He is a very intelligent individual, extremely well educated and very well informed. He knows, or should know, the answer to his own question. It will take credible research of possible vaccine-autism connections to restore public confidence in the vaccine programs. The kind of research that the IACC backed in December of 2008 before reversing itself a few very short weeks later on January 14, 2009. The demonizing of parents as desperate, delusional and dangerous has not worked. Ignoring their anecdotal evidence has not worked. Ignoring credible critics, like Dr. Bernadine Healy, who have presented a strong case for reliable research of vaccine-autism issues has not worked. Refusing to conduct the necessary research while repeating endlessly the discredited mantra that vaccine-autism connections have been dis-proven will not work. It is time to stop the public relations offensive against parents and do proper, credible research into these issues. Pursuing the same strategy of marginalizing parents, ignoring credible professionals and refusing to do the necessary research will not produce a different result, it will not restore public confidence in the vaccine programs. To expect otherwise is ...... insanity.